Isn’t it nice to imagine living in a world where everyone has a decent place to live? This is the vision of the international nonprofit organization, Habitat for Humanity. The sad reality, however, is that the percentage of people living in poverty is at an alarming rate; this poverty rate has consistently continued rising as pay rates are grossly disproportionate to the rising cost of living. As a result, this rise in poverty has resulted in a global housing crisis, leaving many working families to live in substandard, overcrowded, and even unsafe homes. The kind people of HFH offer adequate housing options to qualifying families in need at very low mortgage rates. Recent statistics show that roughly 828 million of the world’s population live in urban slums and poverty-stricken districts; urban areas make up an estimated 50 percent of the world’s communities. Research has proven that, overall, children living in substandard housing are affected negatively in the area of academics. Worse yet, shortages of clean drinking water and poor sanitation practices claim the lives of almost 2 million children a year worldwide. With these saddening facts, it’s a blessing to see nonprofit organizations, such as Habitat for Humanity, in action and continuing their efforts to make the world a much better place. On the positive side, HFH has provided over one million quality homes (some brand new, some renovated) to families in need! That means these working families are more easily able to afford healthcare, food, and clothing. This wonderful organization does even more than provide housing; they offer programs such as financial education and disaster response. There are also HFH “ReStores”, or nonprofit stores open to the public selling donated furniture and appliances; proceeds are used for housing operations. The August/CSRA division of HFH uses their GivingPress nonprofit website to showcase team members, news highlights, and events. With the use of responsive plugins, community members are easily able to apply for housing, enroll in volunteer programs, and donate to the cause. 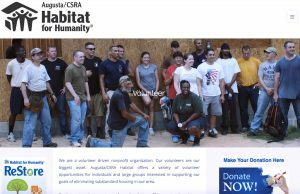 For more information on Habitat for Humanity: Augusta/CRSA, visit their nonprofit website. Thank you, Habitat for Humanity, for helping to make the world a happier and safer place!